It’s official. You got the dreaded phone call. You failed your glucose tolerance test and have been diagnosed with gestational diabetes. You’re going through the stages of grief – denial, anger, etc. You’re thinking – now what? What does this mean? And, how will it affect my baby? I’ve been in your shoes and I know it is no fun. So, let me walk you through some basic points about this annoying pregnancy complication! 1. Gestational diabetes is a serious, but manageable, condition. First of all, don’t turn to Dr. Google right away. I know it is tempting, but that quack is going to send you into a panic! Try to speak with your doctor as soon as possible to alleviate your fears. Basically, gestational diabetes occurs when your baby’s placenta and your pancreas are not getting along and your body isn’t able to produce enough insulin to get your blood sugar in check. Yes, gestational diabetes can cause some serious complications for you and baby. BUT, most complications are seen with uncontrolled diabetes, and your doctor will be watching you very closely from now on to ensure that you and baby are safe and sound. 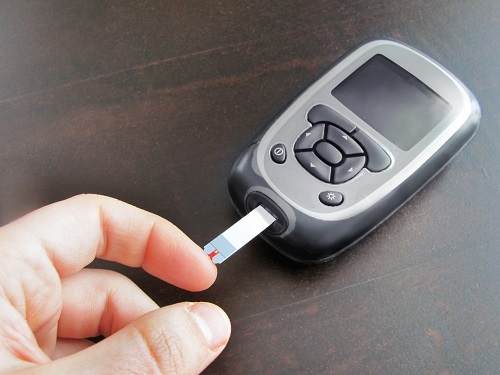 The chances of having completely uncontrollable blood sugars, even with medication, are quite low. 2. This is NOT your fault. Ah, guilt. Such a worthless feeling. While you may have one or more risk factors for gestational diabetes (being older than 35, being overweight, family history, etc. ), you did NOT, I repeat, you did NOT bring this on yourself. Gestational diabetes affects many different types of women. Whether you’re a health nut or a couch potato, you’re not responsible for your diagnosis. GD is a non-discriminatory condition. 3. You may have to make drastic dietary changes….or not. Some women find that they only have to tweak how they were already eating, while others find that lots of foods are now off-limits. You won’t know what works for your body until you start testing your blood sugar and experimenting. For example, I could do mashed potatoes, but if I looked at a french fry, my blood sugar was too high! I could do lots of corn-based products (like popcorn and tortillas), but bread (even whole wheat) was a no-no. 4. You’ll need to prick your fingers several times a day. Lame, I know. It doesn’t hurt that much and you definitely get used to it. Your doctor will probably have you testing as soon as you wake up (your fasting number) and then after your main meals: breakfast, lunch, dinner. You may test more or less, but this is a general guideline. You should receive your testing supplies from your doctor. 5. You may not need medication. Many women are able to control their gestational diabetes through diet and exercise alone. Others, despite their best efforts, need additional help from medication, in the form of an oral medication (like glyburide) or injectable medication (insulin). Your doctor will discuss these options with you. 6. You may receive additional monitoring. After my diagnosis, I started weekly biophysical profiles (a special ultrasound during which they look for certain baby movements, umbilical cord blood flow etc.) and twice weekly non-stress tests (monitoring of baby’s heartrate for 15 or more minutes to check for accelerations and decelerations). It was reassuring to have them check on baby so often, but so many appointments can be a pain, depending on your work schedule and distance from your doctor’s office. Some doctors may not recommend additional monitoring, especially in women whose gestational diabetes is diet/exercise controlled. 7. Your doctor may recommend induction. Again, this totally depends on your doctor. But, if you had your heart set on going into labor on your own, you may want to have this discussion with your doctor soon after diagnosis. Babies born to mothers with gestational diabetes may experience a number of complications that could warrant an induction, like issues with the placenta or macrosomia (fancy word meaning a big baby). Have a frank discussion with your OB about your wishes and what is best for your little one. 8. You’re probably going to feel like a failure…maybe even several times a day. When I first started testing, each finger prick felt like a test. That is 4 times a day that I could “fail” and get a bad number. Talk about a bummer. It is a frustrating process, but you get better and better at it as you go. One day, you’re going to eat a meal that always gives you an awesome number and your blood sugar is going to be too high. You’re going to get mad, trust me. But, you know what? Just write it down and forget about it. You’re doing your best and, no matter what, you’re doing an awesome job! Gestational diabetes is not the end of the world and, chances are, you and your baby will be just fine! Keep your eye on the prize and it will all be worth it once that little bundle is in your arms. Jennifer and her husband, Robert, live in Tidewater, Virginia, and expect their bundle of joy to arrive in November 2013. (Check out her baby guessing game - you could win $100!) Besides expounding on the amazing/scary/life-changing topic of pregnancy, Jennifer is the full-time blogger behind Not Your Momma’s Cookie, where she tries to make cool treats and frequently shares embarrassing stories.